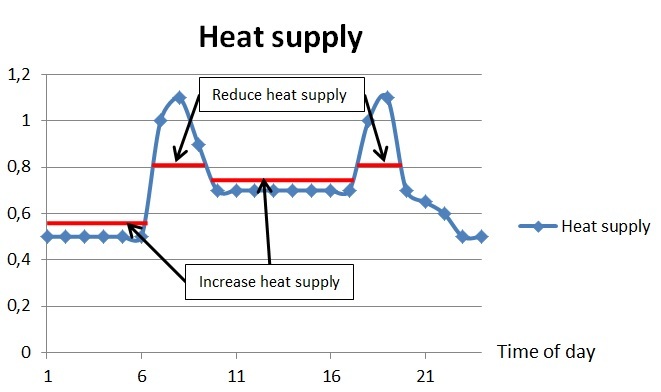 In this pilot the main goal is to reduce the peak loads (W) during the morning and evening by turning of the heat supply to the buildings and only allow heat for tap water. This is possible to do by moving the heat supply to hours of the day when the need of tap water is lower and use the building as an accumulator due to its inertia. The goal is that the comfort for the consumers should not be affected. This may though lead to an increased temperature span that is considered to be in the comfort zone. If consumers agree on the terms on what is in the comfort zone they will be compensated as it is a win-win case economically for both consumers and producers. 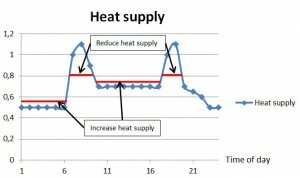 Example of heat supply to a costumer during a day.